This entry was posted in differences, language, shopping and tagged Dutch, expats, language, okra, shopping, Utrecht, xpat blog hop by Alison. Bookmark the permalink. It seems that this strange vegetable – Okra is very popular here, in Thailand. It’s also very cheap. I also saw a dark red variety of it. In the Netherlands for me it was difficult to find yeast (not instant). I also understood that it’s quite difficult to find job there, unless you know Dutch well. I was cycling a lot around Tilburg, Noord Brabant and few times had issues with local guys. I had a nice bike and once I noticed that a very strange guy is following me, this was not nice at all, especially in the middle of nowhere between two villages. Earlier I thought that the Netherlands is absolutely safe. Okra is a traditional food in the southern part of the United States, although not everyone likes it. I didn’t like it as a child, but I love it now and miss having it so readily available. As you said, sometimes you just want to say something quickly and you realize you can’t. I’ll get halfway through putting a sentence together and then realize I don’t know an important word! That just takes time and practice, though. I’ll get there eventually. 🙂 If I were to leave the Netherlands, I’m sure there would be certain foods and such that I would miss. All the differences are what make traveling so fun! This is so true, and one of the reasons I started writing my blog..to get the frustrations out there and for friends to understand how good life is and yet, complicated. The biggest struggle has not been the shopping, although there are times when I want to scream when they don’t have the simplest things, like baking soda. It is a very slow process, and I want to wave a magic wand and magically know the language. I used to be very shy, but eventually got more comfortable speaking with strangers, but now it feels like the shyness is coming back, because I get so anxious that someone will speak to me. I used to enjoy chatting with random people I’d come across. My problem now is that I can read Dutch a bit better, but I can’t speak it easily yet. If I know the topic, I can sometimes follow along when I hear it spoken, but when I have no idea what the topic is, it can be hard to follow along quickly enough. Then I have to revert to English and only then realize that I might actually have understood them. So yeah, a whole variety of frustrations! Good luck to you! Alison, did I ever give you the link to my Baking Soda post? I’ve seen orka heaps of times at the Haagse Markt (ok you are some distance away from here but any similar Markt in a large Dutch city should also have it). Look for a “Tropische Winkel,” near you for other exotic (ie not typically dutch) fuits and veggies too. If you have specific items that are hard to find please let me know… I’ve searched and found a zillion things over the years and am happy tp help you, or anyone else if I can. 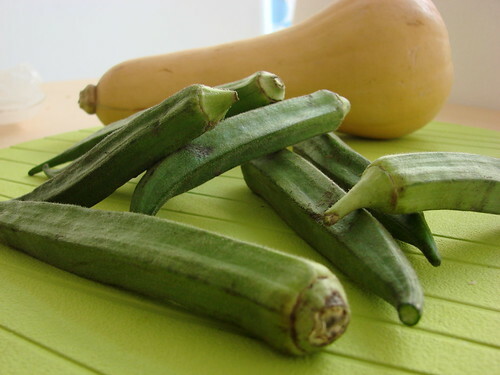 Oh, there’s a kraam at the Saturday market here in town that sells okra and other more “exotic” vegetables and fruits. I’ve even seen durian fruit there a few times! I found them fairly early on, and between them and my tokos, I’m good for most things I need. I haven’t found the chipotle Tabasco that I love here in Utrecht, but I know of places to get it in other cities, if I ever go and remember to look. HI Thanks for linking up! Great! I have never heard of Okra. I find getting sweet potatoes here really difficult, they were really abundant in Gran Canaria. And I get my family to bring over Lemsip from the Uk for colds. I’m enjoying your blog and working my way though some of your different topics. You mention in this on how difficult it is to speak. It’s now almost a year later, how do you rate your abilities now? While my ability to understand Dutch has improved slightly, I’m sorry to say I still can’t carry on a conversation. Other elements of life have gotten in the way this past year and sometimes the motivation to learn the language on my own tends to wane. Sadly, lessons are so expensive.